We can all agree that Facebook keeps track of some pretty strange facts. Did you know that Cody and I didn’t get married on Facebook until after he got a real job? He was afraid if a prospective firm looked him up, saw me, then found my blog it would be game over. It was a big day to change from ‘in a relationship’ to ‘married’ to Cody. Oh Cody. I love him so much. 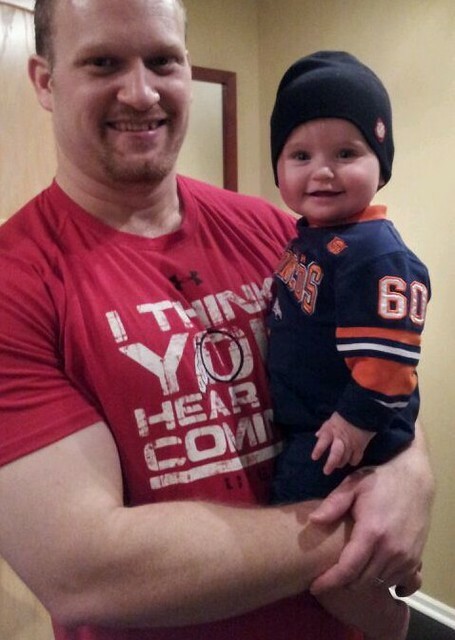 He’s funny, he’s smart, he’s a damn fine dad and have you ever seen his biceps? They’re amazing, which is probably why I could never get behind the whole skinny vampire thing, I like my man arms strong, round and meaty. You want to see his bicep now don’t you? Okay! I’m going to be on a sunny beach in Mexico with those biceps on Valentine’s Day next week. . Sometimes we have moments when we look at each other and think back to the day we met at Radio Shack. 12 years later we’re living in our home with our two kids and our two cats in Indiana. Cody’s a lawyer, I’m a mom and I like cooking dinner and we all like ice cream. Quite the love story, no? Windows Phone wants to hear your love story, they have a special little ‘How We Met’ app on Facebook that pulls information from your timeline about a loved one and tells your story through snappy little live Windows Phone tiles. Apparently Andrea is a very big fan of our love story. 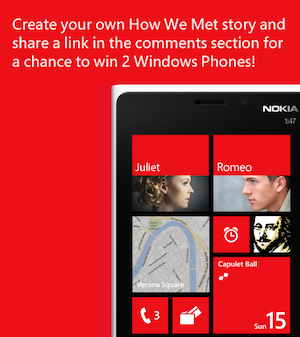 Use the app to tell your own love story, with a best friend, a parent, a sibling or your own significant other and you can be entered to win TWO Windows Phones, one for you and one for your true love. Go to the app, tell your own story then leave a link to it in the comment section below to be entered to win. Winner will be chosen on Valentine’s Day! Contest open to U.S. residents only (Sorry! Phones are limited to U.S. service providers.) Winner will chosen at random from eligible entries and will be contacted via email on February 14, 2013 and have 24 hours to confirm acceptance of the prize. If winner does not respond within 24 hours another winner will be chosen until prize is claimed. Content and/or other value provided by our partner, Windows Phone. For a chance to win a new Windows Phone, click here to take a quick survey. blame the dog? nah, it was totally the window. I’m pretty sure it also works. https://www.facebook.com/windowsphone/app_309982602442327?app_data=story%3d746eb10f-1686-4ca9-a504-0e5138cf20b4%26referrer%3d1266699708 This is really stinkin’ cute! Thanks for the give away, Casey! This has nothing to do with your post, but I’m on a pregnancy induced lovey searching rampage and I was wondering if you could please tell me where you bought bunny?